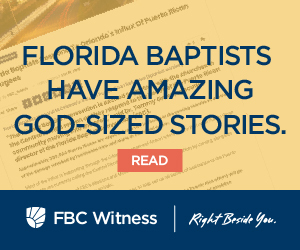 Your Florida Baptist Convention is dedicated to giving away more than we keep. That’s why 51% of Cooperative Program dollars are given to the Southern Baptist Convention Cooperative Program and 49% stay to advance the Gospel in our state. Through the generosity of Florida Baptist churches we are able to steward monies earmarked for the North American Mission Board through the Annie Armstrong Easter Offering and the International Mission Board through the Lottie Moon Christmas Offering, while still faithfully supporting Florida’s Maguire State Mission Offering, Florida Baptist Disaster Relief and our Global Hunger Offering. Third party audited statements are available and are updated each June.